← Popularity Contest: Which injectable is our favorite? Isn’t it a sin that some woman are born with those gorgeous high cheek bones while others of left with the impossible task of fishing through their makeup case trying to find that perfect shade of blush that will make those “apples” pop? Well, there is hope… and it can give you Beauty, Without The Blade. Michelle and Angelina have the classic high cheekbones, and soft heart-shaped faces that make them so visually appealing to both men and women. This has nothing to do with their acting accolades, but everything to do with what we as human beings perceive to be beautiful. Enhancing your cheeks may not get you a role in the next “I am Sam” or “Tomb Raider” , but can definitely give you a younger, more attractive look. The “cheek highlight”, which is the spot where the light reflects off the cheekbone, is a very important part of how the cheek is perceived by others. Highlights that are too high tend to give that artificial “lifted” look, while highlights that are too low tend to make women look older. 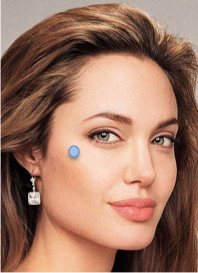 The perfect highlight should fall at a point that is about one inch outside, and a little more than one inch down, from the corner of your eye (Angelina’s blue dot in the picture on the left). Any enhancements made to your cheek should stay around this area… never higher than this. When cheekbones are enhanced above this point, or even when blush is applied higher than the corner of the eye, it will always look a little “fake”, which is never the goal. If you want apples like Angelina without having surgery, you have a few great options. Fillers like Juvederm, Sculptra, and Evolence can all be used to enhance the cheek. They can be injected by a qualified plastic surgeon in the office under local anesthesia, and you’ll see the results immediately. None of the fillers offer permanent results, so repeat visits for re-plumping are always necessary. Sculptra tends to give the longest lasting results, sometimes up to two years. The others stick around anywhere from 4-12 months depending on which one is used. Using your body’s own fat to enhance your cheeks is another great option, and offers a longer lasting result than fillers. Fat can be liposuctioned from your tummy or thighs and transferred to your cheeks during the same procedure. However, the main benefit of using fat is also one of the drawbacks; if you don’t like the look of your augmented cheeks, the fat won’t go away like the fillers. In addition, because only about 50% of the fat that is transferred is happy in it’s new home, your plastic surgeon has to put double the amount of fat in your cheeks to compensate for the first half that won’t survive the long trip from your thighs. This means that you will look a little like Alvin from the chipmunks for a few weeks until the extra starts to dissolve away, but with a little patience, you may not need to have the procedure repeated like you will if you choose fillers. So it all comes down to this. Fillers or Fat? That’s the question you’ll want to talk to your favorite plastic surgeon about. Either way you’ll be all set get the apples you’ve always wanted! Think about it… Any of us would probably enhance our cheeks if we were sitting on a $20M paycheck. But if we’re smart, and pay close attention to BeautyWithoutTheBlade 🙂 we could get paid without permanently looking like Alvin, Simon, or Theodore. Check out this great video related to getting “cheeky”. The 3 Golden Rules For Lip Injections... Forget the Trout Pout! Megan Fox is Gettin' Cheeky With It! Check out her Cheekbone Augmentation!